Starbucks’ seasonal drinks, like the Pumpkin Spice Latte, are something that many Starbucks fans look forward to all year long. In addition to the old standbys, the company releases new drinks every season. Those drinks also vary by region and by country. This means that if you follow Starbucks news, you’ll often see reports of drinks that are not – or are not yet – available in your area. When I heard that Starbucks was introducing a Cranberry Bliss White Mocha inspired by its extremely popular seasonal Cranberry Bliss Bars, I immediately wanted to try one. Unfortunately, they are only available in Japan for now and it would take a pretty pricey plane ticket to put one in my hand tonight. So, instead of heading to the airport, I headed into my kitchen to create a homemade Cranberry Bliss White Chocolate Mocha that we all can enjoy. 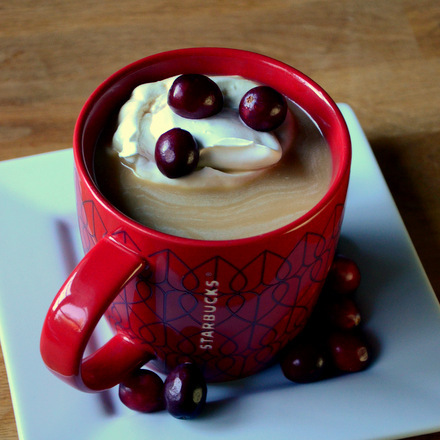 The mocha is made with real white chocolate and a homemade cranberry syrup for a drink that is sweet and creamy, with a hint of tart berry flavor that really captures the holiday spirit. The cranberry syrup is made with just cranberry juice and sugar. It may seem like quite a bit of sugar at first, but the proportions are very similar to simple syrup, which is commonly used to sweeten coffee drinks. I used 100% cranberry juice and highly recommend seeking out the same type of just for the best cranberry flavor. The syrup will keep in your refrigerator, in a covered container, for at least two weeks. In a large mug, combine white chocolate and sugar. Top with hot coffee (or espresso) and stir until the white chocolate is completely melted. Add in cranberry syrup and stir until all the ingredients are combined. Top with steamed milk. Serve with whipped cream and, if desired, garnish with a fresh cranberry or some red sprinkles. Combine ingredients in a small saucepan and cook over medium heat, stirring regularly, until all sugar is dissolved. Cool to room temperature and refrigerate until ready to use.